Just before I acquired my blender, I made my first ever chocolate cashew nut spread. I was delighted with it, but I suspected the Optimum 9200 could do an even better job. This time around, I wanted to try a completely raw version; in the previous one I had roasted the cashews. Nuts and seeds have some sort of enzyme inhibitor that prevent them germinating too early and stop us digesting them properly. Soaking before eating tricks the nuts into thinking it is time to germinate, thus realising the inhibitors into the water which is then thrown away. So a good overnight soaking of the cashew nuts was required. I also added a vanilla pod and dates to the mix. The nuts made for a rather stiff mixture and I had to use the tamper tool to push the mass down a few times. It was also a bit of an art getting the mixture out of the jug. In fact I was unable to extract it all and not being one to abide waste, I ended up “rinsing” the jug out with kefir and making an impromptu and quite delicious smoothie – win win. 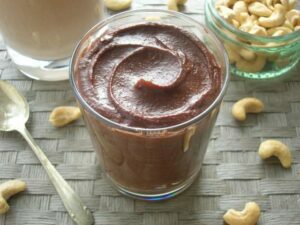 The result was a silky smooth chocolate nut spread that tasted even better than the first one. I had been slightly worried about ending up with bits of strongly vanilla pod, but I needn’t have worried, there was no obvious sign of it, other than the flavour. The dates gave a slight fruity note – an added bonus. We ended up eating most of it straight from the jar, but as well as a delicious spread, it would work well as a cake filler and also as an alternative dairy free cheesecake – now on my list. If you fancy buying one of these fabulous beasts, please do so using this link Optimum 9200. As a Froothie Ambassador, I will gain a commission, but it won’t cost you any more. 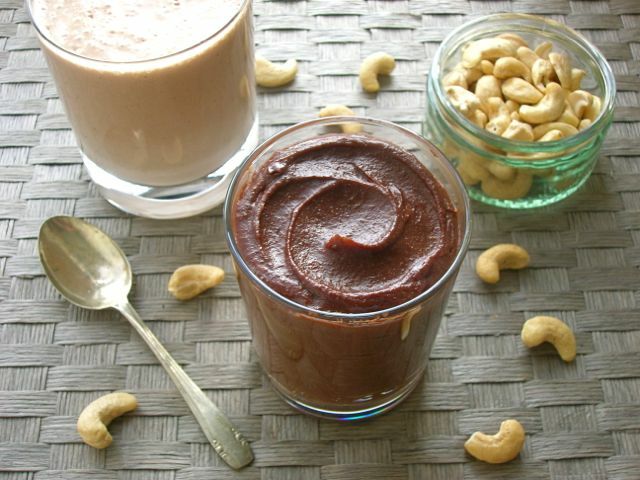 A delicious silky smooth raw diary free chocolate nut spread. Easy to whip up in a blender. Soak the cashew nuts in water overnight. Drain and rinse thoroughly. Throw everything into a high speed blender and blitz until silky smooth. Scrape down the sides as needed and add more water if the mixture is too thick. Scrape into a jar and keep in the fridge until needed. A high speed blender will give a much smoother result. Can be used as a cake or biscuit filling as well as an alternative cheesecake. Keeps in the fridge for a good week or so. Now this is the type of recipe I love seeing on a sunday morning knowing that I have everything in my pantry to make it. Haha, and did you make it Bintu? It’s the sort of thing that pretty much everyone’s going to love but with no guilt involved. Getting thick things out of the blender is a pain Johanna. I’ve found the best thing to do is try and make a drink out of it or add a bit of water if it’s savoury and then add to soups. Quite remarkable! I don’t have a high speed blender, but if I did I’d be sure to make a spread like this. Haha, thanks Janice. I can highly recommend a high speed blender, but I suspect you’ve already guessed that. This looks like a really creamy, velvety spread – bring on the crumpets! What Have I been thinking of Heidi, I haven’t tried it on crumpets yet!!! This sounds delicious! I bet it would give Nutella a run for its money spread on some toast. Oh my goodness. This looks so yummy! Its when you try to make things like nut butters that you really realise the quality of your blender – I tried to make almond butter in my food processor yesterday and I thought it might explode! Can’t wait to make this when I get a better one! Wow, this looks lovely I love this sort of energising raw food. I wonder if it will work in my nutribullet? It would be interesting to find out Anita, definitely worth a try. Sounds lovely! My one attempt at making homemade nutella ended up being very grainy, but I didn’t soak the nuts like I should have. Will give it another go! Was that in the Froothie Elizabeth? I made another version in my mini food processor and that was delicious, but also a bit grainy. Yum. Now when I wrote my recent rant about how unnecessary smoothie makers are, I totally neglected to think about making nut butters and spreads. Some oversight it seems. Haha Chloe, I’m going to have to come and read your rant. I’m thrilled to be making my own nut butters etc, but I’m also finding I can make so many interesting smoothies now that I never could in my old blender. Ah Jen, I love cashews too, but I find it hard to say which my favourite nuts are – I love them all. Good luck with the Froothie, it really is a veritable wonder and I’m really glad I’ve got one. It really is Callie and I’m feeling it’s about time for another batch. This sounds delicious, if there’s one thing I love it’s chocolate spread! What an amazing-sounding recipe Choclette. Loving the addition of dates. I wasn’t aware of the enzyme-inhibitor issue….. interesting! Great that you got an unexpected smoothie out of it too! Thanks Kate. I’ve been aware about the nuts issue for many years, but I rarely do anything about it as it means getting organised. Sally Fallon reckons the best way to do it is to soak a load of nuts overnight and then put them in a very low oven for several hours to go crispy, then store until needed. I read that when I first got her book, but have never managed to do it.